The skeleton arose out of the mist as we walked along the beach. It was not frightening, but rather melancholy – the remains of a ship that had come to a sorry end on the Oregon coast. We had come to the beach at Clatsop Spit, within Fort Stevens state park on the northwest tip of Oregon. While it was sunny and clear inland, when we arrived at the beach a strong fog was rolling in off the ocean, obscuring the view and adding to the misty mood. Approaching the wreck we began to see more detail. Much of the bow’s superstructure remained, with the beams of its iron frame providing the skeleton’s ribs. Most of the rest of the ship had faired less well. It was the Peter Iredale. 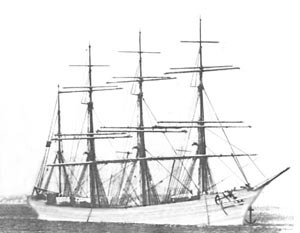 The Peter Iredale was a barque style sailing ship, originally built in 1890. Although the hull was of iron and steel it was still powered by sail, which helped contribute to its demise in 1906. Late on the night of September 26 the Peter Iredale was heading north along the Pacific coast, en route to Portland, Oregon. After sighting the lighthouse at Tillamook Rock it altered its course northeast, heading for the Columbia River which it could follow into Portland. They’d sighted the distant lights from a lightship at the mouth of the river, but encountered a thick mist and lost sight of it. It was nasty that night, along with the poor visibility there was a squall out of the northwest. By the time they saw land it was too late to overcome the howling westerly winds pushing them ashore, and they grounded on the sands of Clatsop Spit. 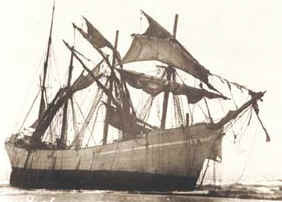 The Peter Iredale, after grounding and in better days. The 27 crewmen were rescued without loss of life. Although the sands were kind to the hull and there were thoughts of refloating it, the tides did not cooperate and it was sold for scrap. These days, 110 years later, what remains is a draw for tourists and campers at the state park. Every year, a bit less of the wreck survives the stormy season, and the ghost moves a bit closer to its final home. Moving away from the wreck, other relics could be found. These too showed signs of age, but in a different way. Some enterprising souls rescued a collection of driftwood from those who would mistake its rustic ambiance for firewood and built a little hut. Who knows how long it has been there: the timbers don’t tell, and they have longer stories anyway. Other bits of flotsam have their own character. The last resting place for what looks like a moose’s head stands guard on the beach, keeping sentry against those who would leave their litter. The remains of gnarled old stumps lay on the beach, looking like fallen soldiers from an ancient battleground. The Ents versus the Sea. Whorls, knobs, and textures that would make a lizard jealous adorn their skin. And so we returned to the ocean. In the quiet mood and the mists, I took a breath of sea air. How do you describe a smell? How does a blind man describe a color? The fragrance was subtle, and changed when a small breeze came along. It was soft and warm and moist, with just a hint of salt and iodine. It fit the grey somehow, and made me wonder – is this the smell of ghosts? Dave, this is a great post. I like how you draw us in for a closer look at the wrecked ship, with both words and pictures. Love that first photo! Thanks Monica. Coming from you that means a lot. Fantastic photos and stories. Makes me pine for the PNW, some of my favorite spots on earth. There’s nothing like that combination of mist, gray, driftwood…the best. Thanks Bill. Sounds like it will not be long before you see it again. Very nice post this is, along with great pictures. So wonderfully moody, and a bit eerie as well. I love the gray tones, especially in that ethereal last shot. A sad end for such a graceful ship. I almost wish they still made tall ships, they look so elegant. You drew us into the moment. Great photos too. It was one of those, this is a lovely, moody place; how can I share it moments. Glad you enjoyed it. Nice images, Dave. I’ll have to check out the Iredale the next time I’m down on the Oregon coast. It has been a few years since I walked on the beach right around there. It had been many years since I’d been there, and it was a first for my wife. I’d never seen it in fog either. Now, I thought you said that you couldn’t write, Dave? That is a superb post. And the photos complement it beautifully. Thanks Mick. 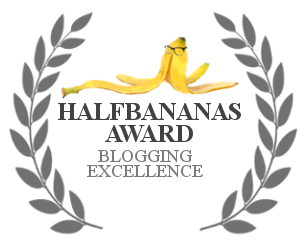 I’m not sure I’ve said I can’t write, but I do feel like a newbie in the creative writing area – I’d only written computer programs and technical documents before getting into blogging. I guess it helped to take a couple writing classes, and to have read a lot of books, newspapers, etc over the years. Perhaps I mis-remembered your actual words – my apologies! But this sounds great. Excellent post! I have not visited the Peter Iredale in years. I often wonder how much longer its skeletal remains will grace the beach. Thanks Mark. When I was researching the wreck I saw a picture from about 15 years ago, and while the bow hasn’t changed that much there used to be more of the hull. I don’t know if its eroded or just gotten buried. This post gave me goosebumps! I just might have to camp at Fort Stevens! Atmospheric piece … a case of less is more! It was kind of a minimalist scene, muted colors, not many people, the usual serenity of the surf, and the bones of the wreck. Wonderful … does the US have the same upsurge of nature writing that we have in the UK – WG Sebald, Robert McFarlane, etc? … also, like many of them, had an ecological perspective and moral message. That was one of his strong points, the ability to sneak in social commentary while maintaining his whacky sense of humor. RIP Sir Terry. What a wonderful atmosphere you managed to conjure up in your description of the place. I’d like to see the remains of the Peter Iredale sometime — preferably on a foggy day for maximum effect! Well holler if you’re in the area – it’d be fun to show it to you. BTW, it also makes a nice backdrop for sunsets. I can imagine. It’s probably also a great backdrop for telling ghost stories around a campfire. Great story/photo combo. I love it when words and pictures come together so deftly to tell a story. Wonderfully evocative words and pictures Dave. I once lived fairly close to the ocean and hope to again some day. Walking on a deserted shore alone with your thoughts is one of life’s great pleasures. Thanks Jason. I have to admit, the beach wasn’t entirely deserted, although there were a lot fewer folks than I’ve usually seen there. While on a few of the shots I could wait until nobody was in frame, I did cheat a little and digitally turned a couple people into ghosts. Just the same, I agree. Walking along an ocean shore, even if there are a few people around, is one of life’s great restorative pleasures. Thanks Melissa. Nice piece on the Sunbeam, and you’re right, there are some interesting parallels. PS: Thanks for the follow.